So after enough comments about people wanting to see the whole collection of paintball guns, I started working on this site. The original theme was to show off the guns I own, but since I buy faster than I can build web pages, I am now years behind schedule. Since I starting playing paintball in the late 80's, the guns have changed a bit. I had always tried to keep all my guns, but during some of the financially hard times some things had to go. I also tried to buy a new gun about once per year. Even today I am not sure how many guns I have owned or currently have in my possession. This site makes a good start to cataloging them all. Go to the Guns Page to see what is installed so far. I am constantly prowling the web for guns to acquire. My current list of guns I am trying to get my hands on include: PMI Magnum pump, PMI Magnum VM68, Shocker (shoebox) 4x4, Tippmann FA, Tippmann SMG Bulldog 68 Caliber, Brass Eagle Poison, Brass Eagle Golden Eagle. I am always browsing sites trying to track down older CCM or AKA autocockers. 2011 Summary: We shall call this the year of solo play (part 1?) . Basically the Rats stopped playing. We did some small gatherings, but only for Fulda Gap did we get a decent size group together. Ronn and Don excited the paintball field owning business, but Splatbrothers lived on - but who knows for how long. 2009 Summary: It was a big year. I played 25 days, almost one month of the whole year I was on the field playing. I lost track of case count, but I think I shot somewhere near 35 cases of paint. I would say I spent the beginning part of the year thinking about playing with the DM7 and then the ending part of the year with it as my main gun. There were a lot of good events during the year, but also some dark spots. Bart closed down the Paintball Virginia field. Skirmish big game was a blast, along with the Ronn Stern paintball camp. Then we come to the end of the year and Wayne's World was a huge let down. I think I convinced the group that we will never return to their grounds. In 2008 we played more scenario events than before, with most of the team dropping rec play completely. Many players were burned out on regular fields, so we took to traveling a bit more. I bought a DM7 about halfway thru the year and keep coming back to it as the best gun in the collection. Ended the year with my latest addition of a Green Chipley S6 pump. 2007 summary: Played more games than past years, did more traveling and bought less guns than I expected (just increased collection by 7). I am now part of the RATS official team, but started my own group - Rooster under them. Work on this site pretty much stalled. 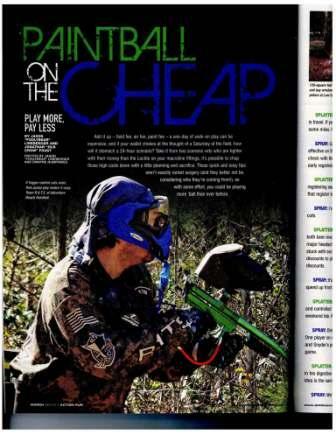 It appears the trend in paintball is moving away from speedball and back into the woods. More companies are paying attention to teams and players who never enter the tournament scene. We shall see what happens in 2008. 2006 : Played seven times and bought six guns(plus some parts). The RATS moved almost completely to a scenario based team as no local fields catch our attention. 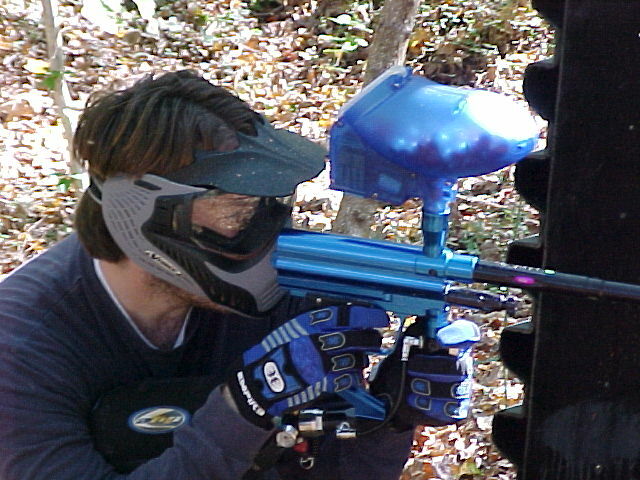 The loss of the ActionTagg field divides most of the regulars into those willing to travel and continue playing and those willing to give up paintball for good. I end this year thinking my Cyborg is the best overall gun for my playing style, except for Tourneys or speed events where I will continue to use the DM5. Looking forward I hope to expand the collection of older 80's pumps. 2005: ActionTagg brings out our team RATS. The Regular ActionTagg Squad or something like that. The RATS begin traveling to other fields and playing as a registered team. Some of the RATS break off and begin playing tournaments at Black River. The end of the year brings the sale of the store and field to Real McCoys Paintball, which many believe is the end of Tagg as we know it. I end the year thinking the DM5 is the best gun for speed and my Viking is the best overall gun.